Thanks to everyone who voted for the Organ Grinder Monkey in the Plushteam’s Steampunk challenge. Alas, I did not win, though I think I came in second, which is no small feat considering the competition! The most deserving winner of the gadget category was Becky Gould of Scrumptious Delight, and her amazing blimp. You can vote for the overall winner through April 30th, so get to it. In other news, I have finally succumbed to Tumblr, and now I am wholeheartedly addicted. (For those of you unfamiliar, Tumblr is a public internet place where you can collect and display everything you find online that you think is awesome. There’s so so much.) You can see all that craziness here. Follow me? I have also taken up photography. Well, I’m trying to. (I’ve started taking classes at this place.) This week I learned what all those numbers on my camera’s lens mean. That was an eye-opener. Also learned about the depth-of-field preview button. Who knew? Now that I spend more time click-click-clicking, I have a slight bit less time for needle pushing, but I’ll never quit plush. I love it too much! Here’s a glimpse at some of my photo homework from this week – an attempt at manipulating shutter speed to capture motion. 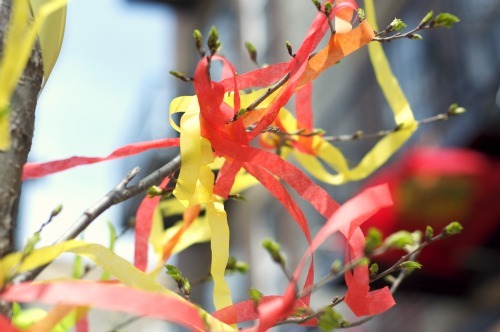 Those streamers were blowing in the wind this past Easter Sunday, but you can hardly tell due to my superior photography skills! I am figuring it all out, slowly but surely. Be patient with me and I promise there will be much more artsy and craftsy eye candy to come!